The latest edition of ‘Youth Pathways 2019’ has arrived in schools and parishes across the Sandhurst Diocese. The booklet produced in partnership by Sandhurst Youth Ministry and Adult Faith Education Sandhurst outlines opportunities to assist young people on their faith journey. The Sandhurst Diocese has produced a booklet is a book of prayers based on paragraphs in Pope Francis’ ‘The Joy of Love’ (or Amoris Laetitia, 2016), in which he offers wisdom and guidance for families, engaged and married couples, and the communities and individuals who may walk beside them. In this little book, the Pope’s words are arranged as prayers, for couples, families and communities, to pray for themselves and others.. The Sandhurst Diocese has produced a prayerbook based on paragraphs of Pope Francis' Apostolic Exhortation on love in the family, 'The Joy of Love' Amoris Laetita, 2016. The booklet is a book of prayers based on paragraphs in Pope Francis’ ‘The Joy of Love’ (or Amoris Laetitia, 2016), in which he offers wisdom and guidance for families, engaged and married couples, and the communities and individuals who may walk beside them. In this little book, the Pope’s words are arranged as prayers, for couples, families and communities, to pray for themselves and others..
Bishop of Sandhurst Leslie Tomlinson reads the Plenary Council Prayer at the Sacred Heart Cathedral on Pentecost Sunday in preparation for the Plenary Council in 2020. 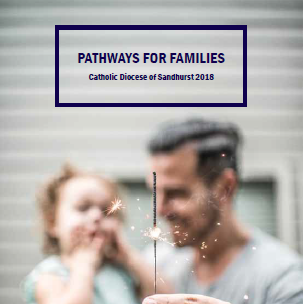 The latest edition of ‘Pathways for Families 2018’ has arrived in schools and parishes across the Sandhurst Diocese. The booklet produced by Adult Faith Education Sandhurst outlines opportunities to assist families on their faith journey. The Book of Prayer based of Pope Francis' The Joy of the Gospel is available in schools and parishes across the Sandhurst Diocese. The booklet produced in is available through Adult Faith Education Sandhurst. The latest edition of ‘Pathways for Young Adults 2018’ has arrived in schools and parishes across the Sandhurst Diocese. On September 1, Pope Francis asks us to pray for creation. “SIMPLE FAITH: WHAT DOES IT MEAN TO BE A PERSON OF FAITH IN THE 21ST CENTURY? " THE OTHER SIDE OF CHAOS: WHERE IS GOD WHEN LIFE IS BREAKING DOWN? You are invited to be part of a dialogue on how to incorporate the vision and challenge of Pope Francis’ encyclical ‘Praised be you: On Care for Our Common Home’ into our everyday life, organised by Catholic Mission Wagga Wagga Diocese. During his first three years in office, Pope Francis has published two major works - to help us live life to the full, in the joy of the Gospel, and to encourage all people everywhere to bring about a better world as we care for our common home. Gift yourself with time-out, a gentle day or evening, ‘Good News & Contemplative Living in a World of Chaos’ with Dr Donna Orsuto (Lay Centre Director & university Professor in Spirituality, Rome). A free Faith Education Session is available featuring Father Brian Boyle. He is a lecturer in Scripture at Catholic Theological College in Melbourne. He is a priest of the Diocese of Sandhurst and is the Bishop’s Vicar for Education in our Diocese. He is very interested in Adult Faith Education and in opening the treasures of Scripture with and for other adults. ‘WHAT IS GOD’S MESSAGE FOR ME THIS HOLY WEEK AND EASTER?